A live radio broadcast from Ultrasonic Recording Studios–first transmitted on New York’s WLIR FM–American Poet boasts excellent sound quality, frenetically high-tensile rock accompaniment from his then backing group The Tots, awesomely passionate versions of “Heroin”, “White Light” and “Rock and Roll” and an interview in which Lou Reed talks–with typical verbal economy–about Mick Ronson (“he’s naughty”), David Bowie (“empathy… [audience giggles]… no, not in that way”) and the Velvet Underground’s Doug Yule (“Dead, I hope”). Icy of demeanour, fiery of rock & roll heart, this is the Ziggy-esque leather-and-eyeliner Lou Reed, returning to home soil on the back of his recently released second solo album–the Bowie/Ronson produced (and influenced) Transformer. This Solo concert of Lou Reed 1972 in New York, titled American Poet became a sought after bootleg ,quite possibly the best Lou Reed (unofficially released) live album of the lot. Unlike the excessive ‘Rock n Roll Animal’ and ‘Take No Prisoners’ ‘American Poet’ strips Lou’s sound down to reveal what lies at the heart of his music. The mixture of Velvet Underground and solo material here reveals Lou to be a first rate songwriter and his crisp and clear vocal style shows him to be a fine vocalist also. The versions available here are all very strong. I particuarly love Lou’s slowed down version of ‘I’m Waiting For My Man’ and also ‘Berlin’. I’ve never heard ‘Berlin’ sound so good. It was recorded in 1972 around the time of the release of ‘Transformer’ and was only available in bootleg form up to more recent years. Shortly after his separation from the Velvet Underground and immediately after the completion of his second solo album “Transformer”. Contained in the middle of this CD is also a short radio interview with Lou Reed, which doesn’t disturb at all, but fits in very well. Lou Reed is at his best. Obviously he never plays a song twice in the same way, which makes his live albums very interesting. In my opinion each song on this CD is excellent, and I don’t want to highlight any one of them especially. 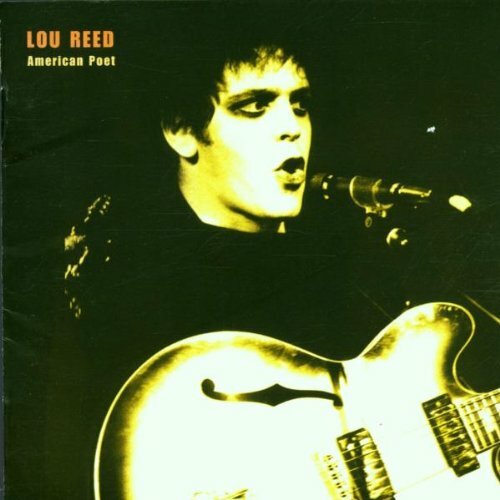 ‘American Poet’ does perhaps lack some of the technical proficiency musically that can be found on Lou’s later live albums but it does reveal the core of his musical talent to a much greater degree. The day after Christmas, December of 1972: Lou Reed and band (The Tots) in Hempstead, NY, recording live for radio at Ultrasonic Recording Studio. Recorded just a month after the release of Transformer, the set finds Lou Reed pulling from the new record, riffing on five Velvets tracks and the penultimate “Berlin” – the track that would title his next release six months later.